Disturbing .gif of American obesity issues over the years. If you catch it halfway through the gif animation, just wait it out until it starts over so you can see it all. Another Mario game. This time, hit space bar to switch between a normal Mario game and tetris to add blocks so Mario can climb through new obstacles. Really sketchy bunny pictures. I'm not this creepy, right? Bookcases galore. Lots and lots of them shown here. Drumbrella. 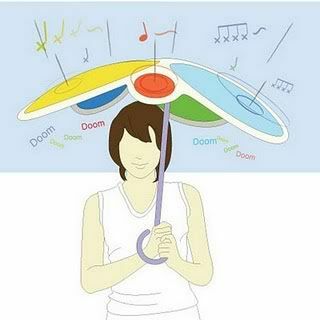 This rain drum could either be really cool, or really, really annoying. 8 month old baby hears mommy for the first time after having implants put in. I Love Traffic game - Rush through traffic lights to beat various levels. It gets tougher with more lights to switch on and off. I'm playing catch-up here. I know we have a lot of books, but WOW! !